Sorry for not posting much in the past couple of weeks. It's been pretty crazy around here, and on top of that the muscle problems I thought I had finally gotten rid of flared up again and I just don't have the ability or time to let them rest long enough to heal. So painkillers it is! So just what have I been up to? LOTS of things! First off, time for a catch up on my recent cosplay pics. 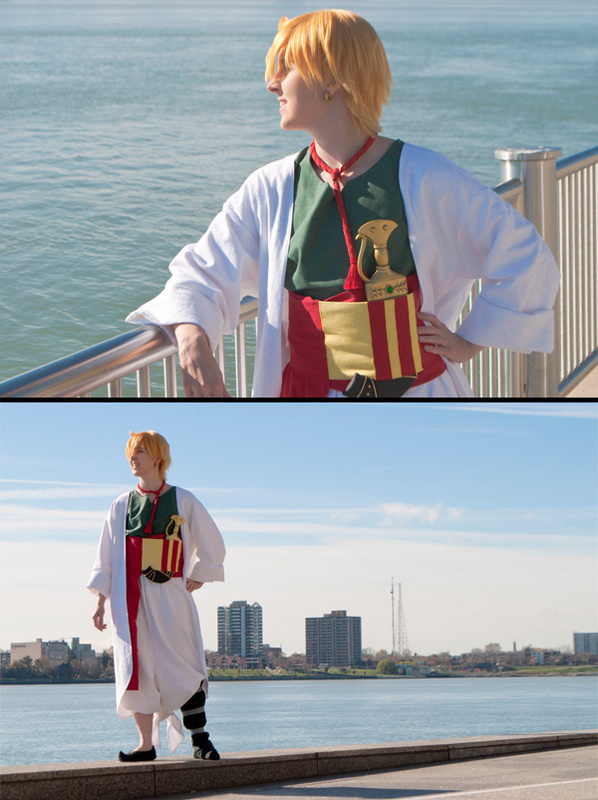 I debuted a new costume, part of a costume, and got pictures of a previously made costume. 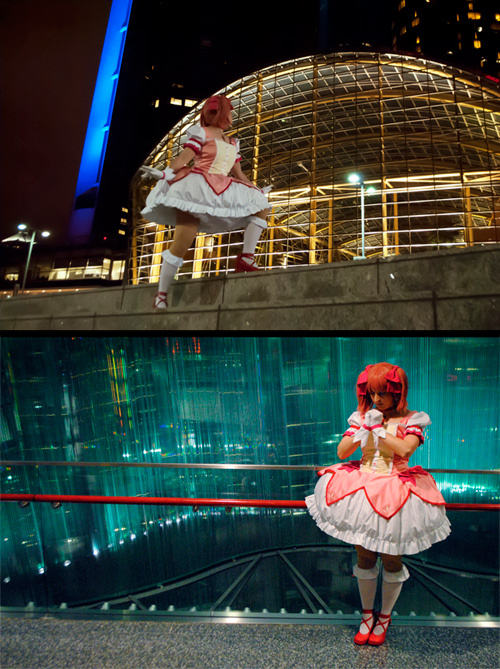 Re-Debuted Costume: Madoka Kaname from Puella Magi Madoka Magica. 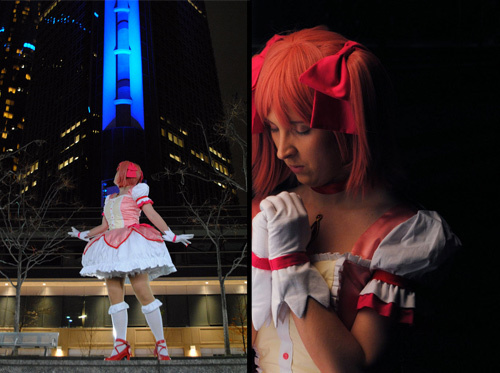 I made this one around August, 2012 for Anime World Chicago to go with a couple of friends of mine also going as fellow magical girls. You might recognize one of them... PHD Cosplay. :P She went as our Mami - but alas, she was not at Youmacon this year as Mami sooooo maybe photos later. Here's some of my favorite shots we got, unfortunately they were all at night so I'm hoping for some outdoor shots and getting my magic bow done too. These photos were taken by Sweet Sensation Photography. 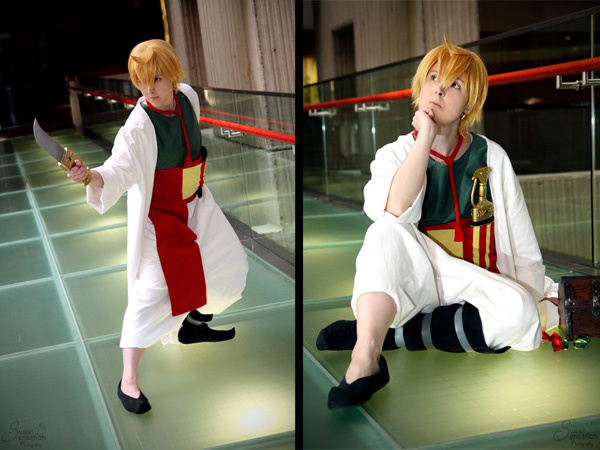 I had a lot of fun wandering around as Alibaba and I'm probably gonna take him to more conventions. :P I just need to add some safety padding into the shoes - they ate my feet a little. If you've visited my booth in years past, you might recognize a couple of these. 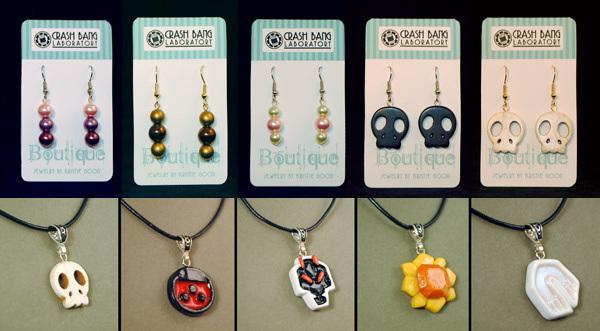 I used to have necklaces for sale, but frankly, I ran out of space in the booth for them! So I have not only put them up, but I've created a new area called the "Boutique" - where I make simple jewelry for low prices! They're nothing complicated. Usually simple drop earrings or studs, and sometimes the occasional pendant necklace. 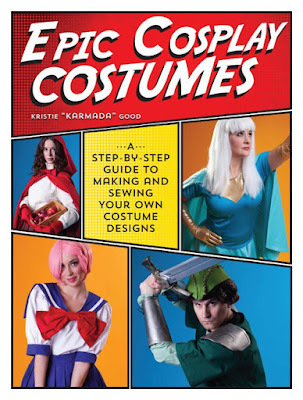 But if you're looking for an inexpensive addition to your outfits (or even cosplay, I will take commissions on accessories), these would be your best bet! If anybody has any styles or commissions they are interested in seeing, let me know! I have a lot of random jewelry stuff sitting around. Now to the heart of the matter of my issues. 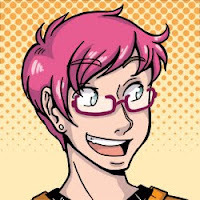 I recently restarted up Sky's End - my first webcomic (if you don't count Tangerine Wings or Alley Dwellers). And I was doin pretty good for a about a week and a half. Then some personal stuff happened, and in a fit of cleaning the house from top to bottom I completely EFFED my arm/hand/elbow muscles up completely. Trying to hold a pencil or pen is difficult (but not impossible) but instead of just pain, I have a hard time coordinating it to draw properly. I'm going to be trying to make some sketch cards to warm my arms/drawing muscles back up, but at this time I feel stuck. I need to have it sit and do nothing for like a week or two, but I just can't afford it. And with my arm being my main source of income at this time, you can imagine this stresses me out greatly. Couple that with the Holiday Blues (that's a whole other rant on itself), I find myself occasionally spiraling into an awful depression. But I don't want to be sad at people all the time. It only provoke people into a "Who's Sadder" contest, and I don't want that. So, needless to say, I'm Working On It. I float from happy to sad on a day to day basis, but here's hoping I can draw properly sometime soon. I'd love to have more comic pages up starting next week. In other news, if I got a livestream account and did livestreams of my marker work, would people be interested at all? I mean, I'd just be doodling/drawing/coloring stuff in, but hey, sometimes people like that. oooooooooooooooh I love livestream things! I would love to see the marker work because it's not something that comes intuitively to me. Let me know and I'll be there!